Guest speaker Esther McVey, MP forTatton, helped to launch Wilmslow High School’s new Business Partner Programme recently. The Business Partner Programme theme is to generate ambition, inspiration and opportunity for young people. Its key aims are to connect business with education, to promote careers support for High School students and to achieve financial contribution through sponsorship opportunities. The programme has been welcomed by the business community who have been keen to forge links with the school, as well as to develop a relevant business forum for the area. Welcoming the audience of over 100 attendees including representatives of local businesses and other school partners, Headteacher Dr James Pullé spoke about the importance of the school being positioned at the heart of the community, particularly because “It takes a village to raise a child”. Once networking had concluded, there were two short speeches which highlighted the benefits of being involved in this initiative: Paul Hinchcliffe from local law company, Bott + Co, spoke about his company’s worthwhile and positive experience working as a business partner with the school over the past year; this has included input at careers events, provision of work experience placements and sponsorship of the High School sports teams. Paul was then followed by local MP and Secretary of State for Work and Pensions, Esther McVey, who talked passionately about the need for other schools to follow Wilmslow High’s lead as a forward thinking school, trying to find creative ways in which businesses can support the educational experience and outcomes for young people. She went on to say in a later tweet that the programme was a “Brilliant initiative, forging greaterpartnerships with local businesses and business leaders”. To coincide with the event, the new Business Partner Programme website has also been launched. 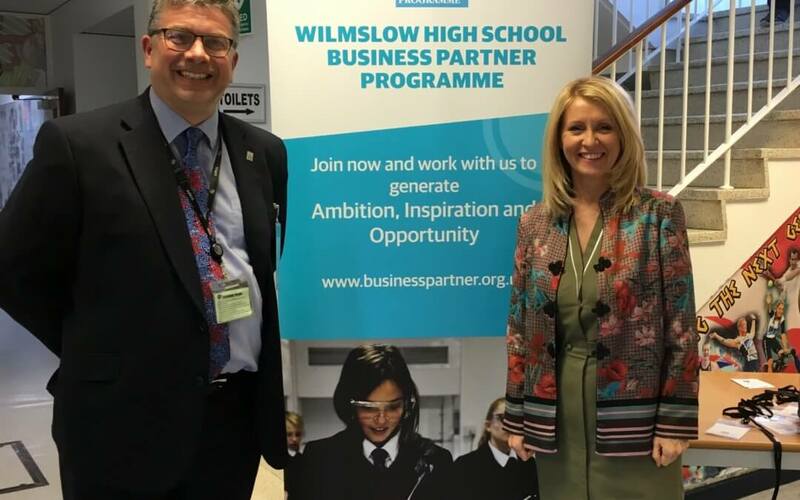 Businesses with an interest in connecting with Wilmslow High School can find out more information here. Feedback was extremely positive and businesses are looking to meet on a regular basis. The next event will be held on Tuesday 13th November at 6pm – if you would liketo attend please email bpp@wilmslowhigh.com.